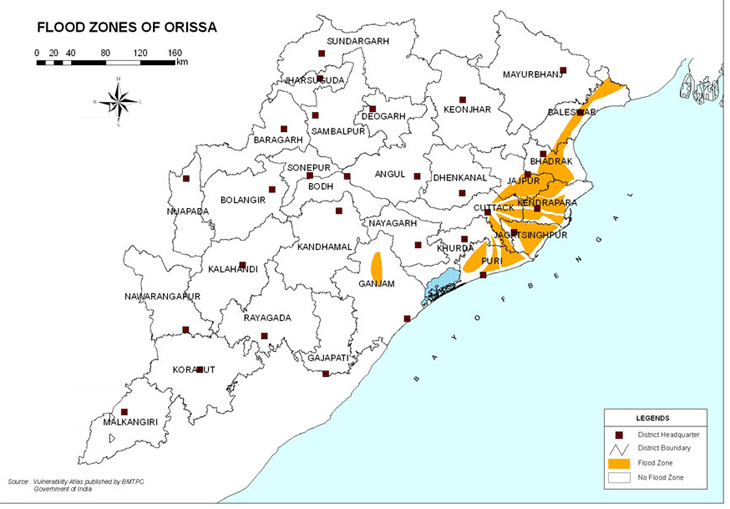 The State Odisha has a history of recurring natural disasters. While the coastal districts of Odisha are exposed to floods and cyclones, western Odisha is prone to acute droughts; a large section of the State is also prone to earthquakes. In addition, the State is also affected by disasters like heat waves, epidemics, forest fire, road accidents etc. The history of disasters substantiates the fact that about 80% of the State is prone to one or more forms of natural disasters. Odisha has a history of recurring natural disasters. 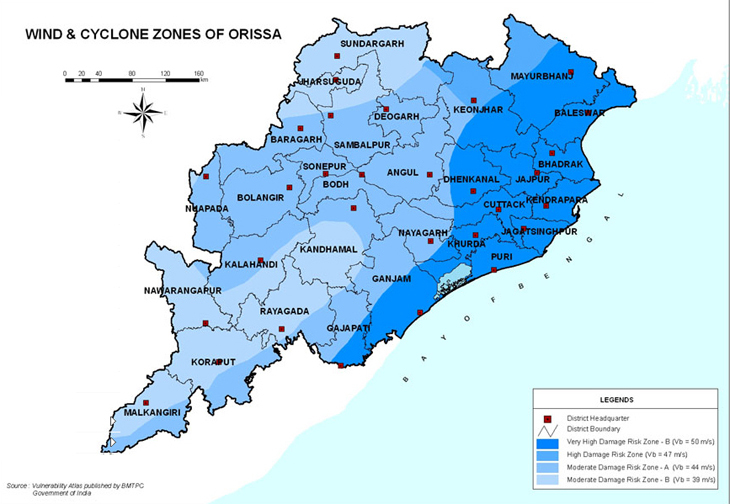 While the coastal districts of Odisha are exposed to floods and cyclones, western Odisha is prone to acute droughts; a large section of the State is also prone to earthquakes. In addition, the State is also affected by disasters like heat waves, epidemics, forest fire, road accidents etc. The history of disasters substantiates the fact that about 80% of the State is prone to one or more forms of natural disasters. The two successive cyclones in October 1999, the severe cyclone which hit in the District-Ganjam coast and the Super Cyclone damaged the infrastructure in 14 districts of the State and disrupted public life. With millions of trees uprooted during the super cyclone, the State, especially the coastal belt has become extremely vulnerable. With 80% of annual rainfall concentrated over 3 months, the State is highly vulnerable to floods. High population density, encroachment on the flood plains, poor socio-economic condition, weak infrastructure and mud houses increase the vulnerability. Out of total geographical area of 15.751 lakh hectares 1.40 lakh hectares are flood prone. There are 516 nos. of vulnerable points in Odisha. Floods are the most recurrent disasters in the State. In the last 25 years, floods have occurred 12 times with varying severity. 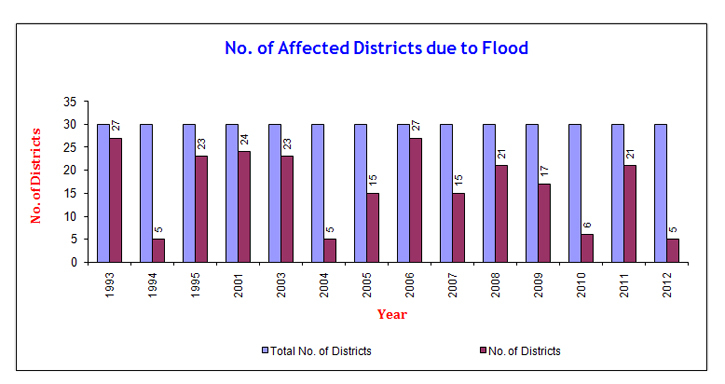 Report says floods occurred in 27 districts in July-August 2006 with a loss of 90 human beings, 1656 livestocks. 3.104 lakh hectares of crop and 120446 nos. of houses damaged. Odisha is always vulnerable to cyclones in April-May and September-November. Once every few decades a super cyclone strikes Odisha. Recent Super Cyclone that hit Odisha in the last Century were in 1942, 1971 and 1999. The Super Cyclone of 1999 killed about 10,000 and traumatized millions who survived its wrath. Over 15 million people were affected. Throughout India's massive coastline, there area 250 cyclone-warning sets, of which 34 are in Odisha, covering 480 Km of coastline. Odisha State Disaster Mitigation Authority (OSDMA) promotes Community Based Disaster Preparedness activities so that people can face emergencies in an organized manner. OSDMA was formed to coordinate and implement the reconstruction work after the super cyclone, keeping in mind the need for disaster preparedness to face any future eventuality. During Super Cyclone of 1999, 97 nos. of blocks and 28 ULBs and about 12569000 population were affected. The total agricultural land affected was 1733000 hectares with 9885 nos. of human casualties. The State has experienced two severe tornadoes in the past. The pattern of drought in the State is of a varied one, sometimes affecting the entire state, sometimes a few regions, and sometimes a few districts. However, the contiguous patch consisting of the Subdivisions of Padampur, Bolangir, Titlagarh, Patnagarh, Nuapada, Khariar, Bhwanipatna and Phulbani comprising of 47 blocks have been identified as drought prone zone. More stress is being given on minor irrigation, crop diversification, soil & water conservation and rainwater harvesting. In the State, 2000 people died due to heat wave during 1998. After 1998, the frequency of occurrence of heat wave decreased. 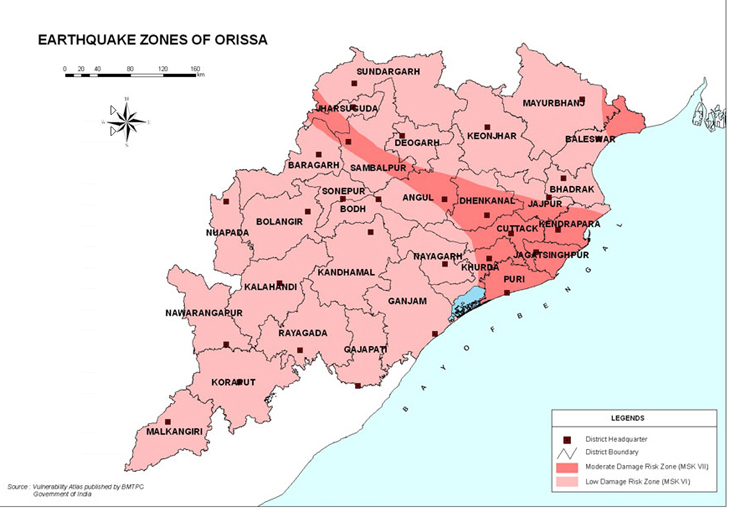 The seismic zoning of Odisha falls between zones I to II i.e. low damage risk zone and moderate damage risk zones. The parts of districts coming under moderate risk zones are: Sundergarh, Jharsuguda, Bargarh, Sambalpur, Deogarh, Angul, Dhenkanal, Jajpur, Cuttack. Khurda, Puri, Jagatsinghpur, Kendrapara, Bhadrak, Mayurbhanj & Balasore. While districts coming under low damage risk zones are Malkangiri, Koraput, Rayagada, Gajapati, Ganjam, Kandhamal, Nawarangpur, Kalahandi, Nuapada, Bolangir, Sonepur, Boudh, Nayagarh and Keonjhar. The entire districts of Jagatsinghpur comes under the moderate damage risk zone. In recent years, the earthquake in Deogarh-Bonaigarh area in 1995 caused substantial damage. Prior to this, earthquake tremors were felt in Talcher and Rengali Dam area. Current seismicity is related to activity along Gondwana Basin boundary faults and those associated with continent – oceanic crust transition zone in the Bay of Bengal. After the Bhopal gas tragedy, 2 of the 20 recorded major chemical accidents in the country have occurred in Odisha . One in 1987 due to ammonia and methane gas leak and other one in 1989 due to chlorine leak. The major potential hazard areas in Odisha are: Paradeep, Rourkela, Ganjam, Cuttack, Angul-Talcher, Balasore, Jharsuguda-Belpahar and Rayagada. There has been an alarming increase in the number of road accidents in the state in recent years. Poor road conditions, weak enforcement of laws, disregard for safety values, mechanical failures and lack of road awareness are the main causes of road accidents.